It’s Monday, which means review day. Hooray! 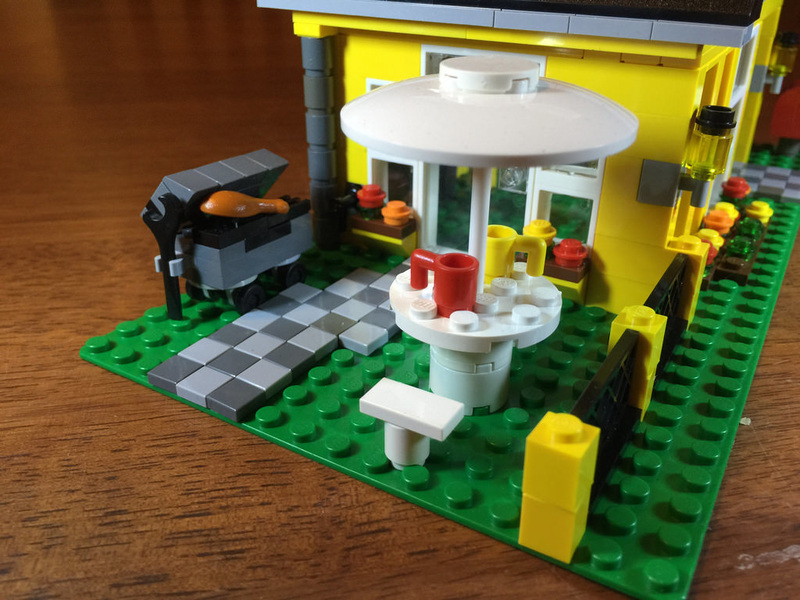 Today’s set is a quaint little beach house from the Creator theme. It’s a multi build, so there are two other models that are able to be created, but I’ll only be reviewing the main build. The other two models are a three-storey tower, and a neat little cafe. 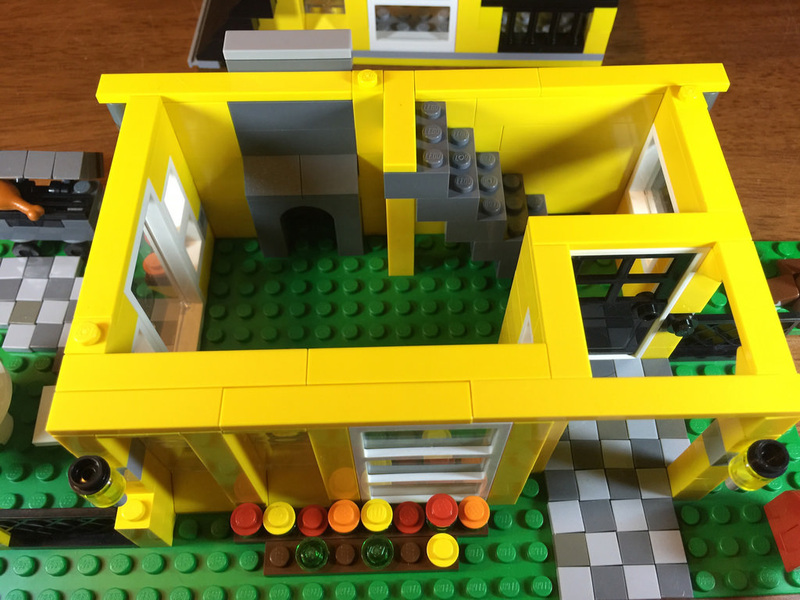 It’s a pretty nice set, with the top half of the building separating from the bottom, modular style. There’s a pretty varied range of elements in this build, and one in particular is still very unique for the element and colour. This is the 45 degree angled window and frame at the top of the building. 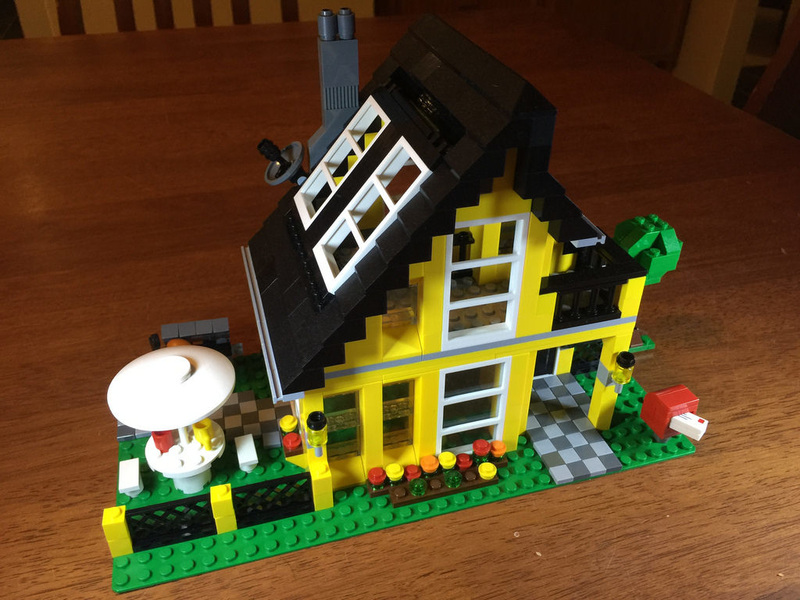 It opens as well, so it’s pretty nice.Some of the other nice-to-haves are the umbrella (a white 6×6 dish), the drumstick, and the different styles of roof bricks. It’s not a bad nice range. I’m going to rate this set as a standalone set, so not including any other collections. It probably sounds strange, as 99% of LEGO fans will have more than this set, but it makes a difference with this aspect. 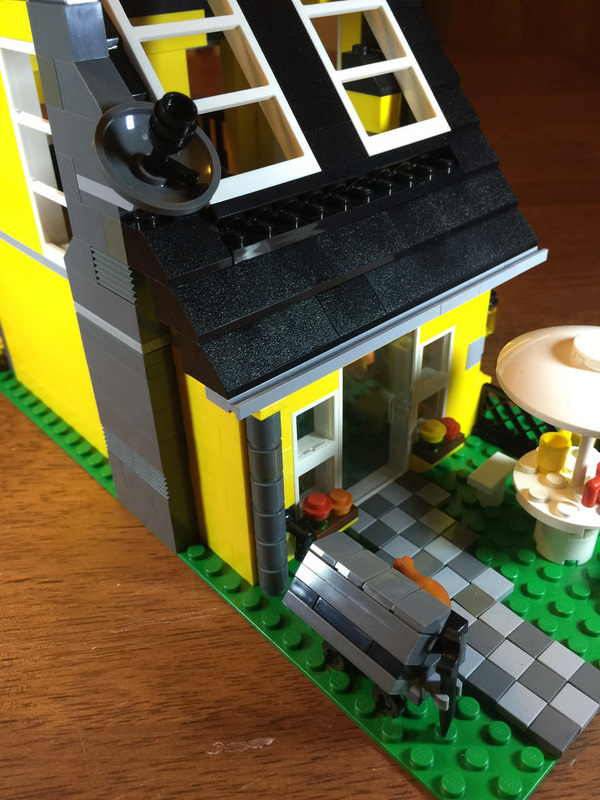 It’s a minifigure scale house, with no minifigures. It’s a crying shame, as it would be pretty great to have at least one minifigure! 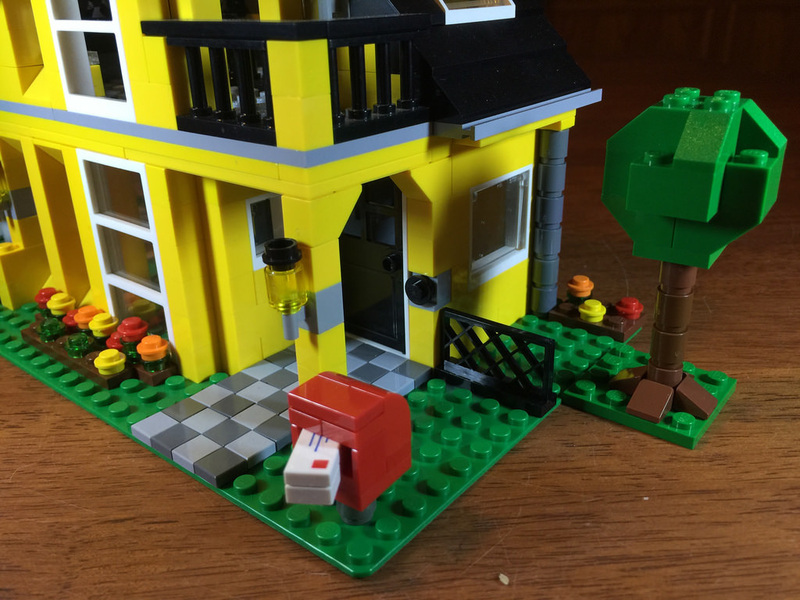 It’s not as if Creator sets have no minifigures ever, the modulars are a big example of this. The interior of the house is empty, but the exterior has a few play elements in the barbeque, seating and letterbox, but that’s really it. Yes, the roof opens for easy access, but to me, it’s not really a set that would feature highly in a play aspect. Add a minifigure or two, however, and it would get a higher rating – not huge, but maybe at least a 7. With the other builds, especially the cafe, it would get around an 8. The build is pretty satisfying. While walls are not really all that fun to build, it’s interesting putting together the stairs as the interact with the wall, as well as the fireplace. The tiling of 1×1 tiles is nice, but it’s tricky to get them perfectly straight. Once the bottom floor is done, it’s on to the top floor. It’s a little cramped, but it’s strong, especially for the roofing. It’s not exactly difficult, but it’s satisfying to see rise off the baseplate. While the elements included in the set are pretty varied, they’re mostly all in one colour – yellow. It’s great to have this as it boosts the yellow elements in a collection, I don’t think it’s the right colour for a building. Looking at the details is where it’s at though. The garden beds are a nice inclusion for a pop of colour, and I love the little outside tap next to the downpipe. At the roof, the satellite dish and chimney stack is beautifully crafted, and the simple things like gutters is nice. My favourite details are the barbeque, tree and the letterbox. They’re simply crafted, but instantly recognisable. I love them and will be using them again in MOCs down the track. This one is pretty low for value for money and collectibility. It’s a pretty run of the mill set, and is fetching a couple of dollars extra on the secondary markets. There’s nothing that screams “I must have this set!”, but it’s probably nice to add to a cityscape. 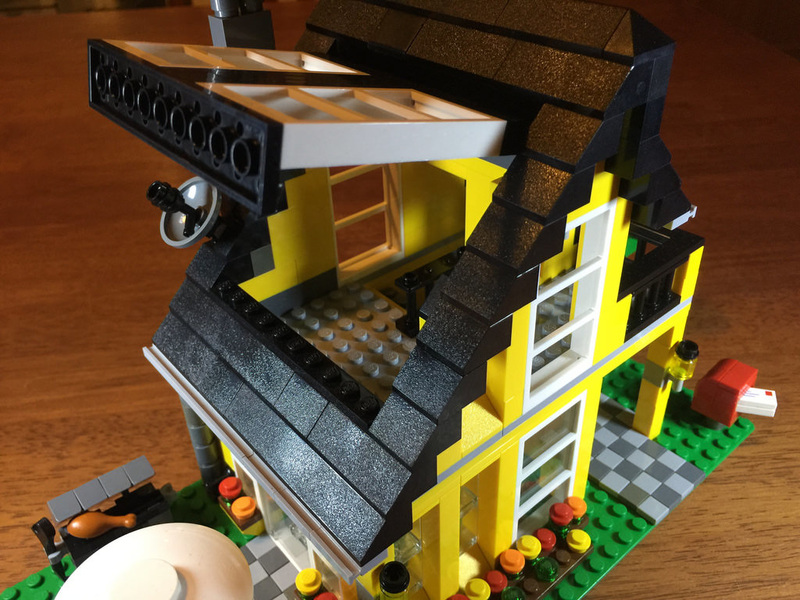 At 31/50, it’s a pretty standard set, but I did enjoy building it. It was in the big bulk lot I’m still working through, so it was nice to thin out the black and yellow piles! That’s it. What did you think of the set? If you have it, please let me know what your thoughts were. I’d love to get a conversation started. Next week I’ll be reviewing something from the very popular LEGO Movie theme – 70812: Creative Ambush. It’s a nice little set!